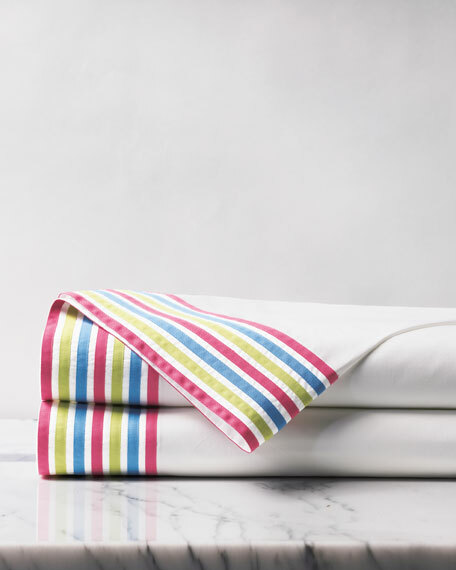 Fitted sheet with striped edge. Duvet with allover leaf stitching. Viscose/linen/cotton/rayon. 114" x 98". Oversized to accommodate pillow top mattress height. Made in the USA of imported materials. Striped fitted sheet. 200-thread count cotton percale. 4" self hem with single needle topstitch. 18" pocket depth. Machine wash. 72"
Striped fitted sheet. 200-thread count cotton percale. 4" self hem with single needle topstitch. 18" pocket depth. Machine wash. 72" x 84". Imported.